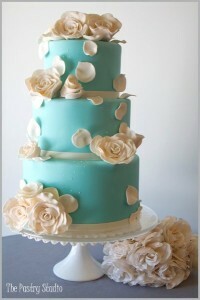 Today’s cake is decorated in a hue that reminds me of the sea around some of my favorite Caribbean islands. And if you’re hosting a destination wedding on one of those islands, this cake would be perfect. Of course it would also be lovely at a land-locked wedding too! The addition of the white roses (which look edible) is perfect. 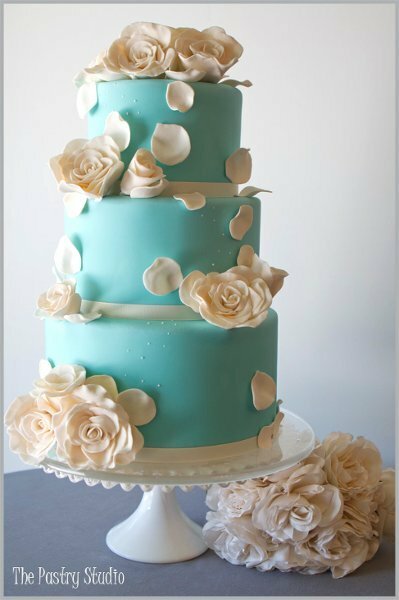 I love how the petals are falling down the side of the cake. You can find this cake here. It was created by The Pastry Studio.